Using thermos-coagulation and Thermolysis (Advanced Cosmetic Procedure), over 20 different skin blemishes can be quickly, safely and effectively treated offering an eventual blemish free smooth skin. Certain skin blemishes can be removed in one treatment but others may need several treatments before complete removal is achieved. As far back as the early 1900’s Electrolysis was being used for the treatment of unsightly skin blemishes and since that time, it has progressed a long way and it is a safe comfortable and effective treatment. The treatment uses a Short-Wave Diathermy electrical current (heat) or use of Nitrous Oxide by Cryotherapy (cold) in both cases the treatment is extremely safe and effective and creates a localised effect in the target area. Treatment results in a controlled destruction of the tissue and its eventual removal by the body’s innate healing mechanism. When treatment of the vascular conditions is carried out, diathermy method is usually selected as it allows a finer ‘pin point’ accuracy. The minute blood vessel is sealed by means of cauterization or decomposition. As the skin capillaries are like the fine twigs on the branches of a tree the blood is merely diverted to an alternative ‘branch’ or capillary and the blood supply to the tissue remains fully functional. The same techniques are used for spider naevi and cherry angiomas or blood spots. The removal of thread veins with advanced electrolysis is generally permanent but further damaged vessels can arise subsequently to take their place depending on the skin condition and the extrinsic and intrinsic factors, which influence the skin’s sensitivity. Removal of these conditions will be permanent but you may require multiple sessions and regular ‘tidy up’ sessions every 12 months or so, to remove any new vessels that may emerge. For the removal of seborrhoeic warts, viral warts, sebaceous hyperplasia, milia and larger skin tags, the short-wave diathermy current cauterizes and cuts through the tissue with its subsequent removal. The blood supply to nourish any further growth of the lesion is sealed off and the blemish will heal fully within few days to couple of weeks leaving minimal, if any, marking at all to the skin. 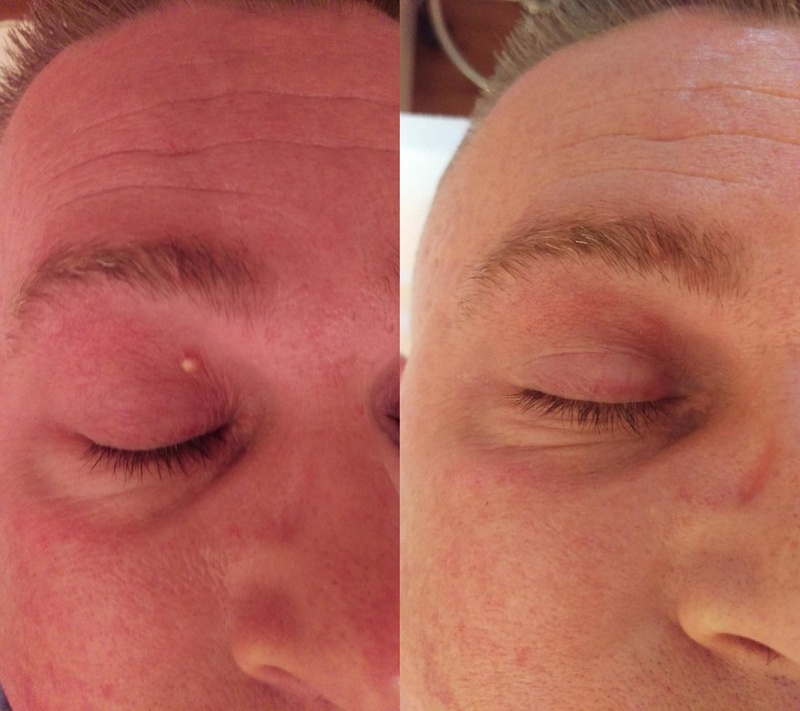 The permanent removal of these lesions is generally achieved in one or possibly two treatments depending on their size. What does the treatment involve and does it hurt? A very fine needle probe is used to pass the heat of the electrical current or Nitrous Oxide by Cryotherapy (cold) into the tissue. This is so precise and localised that only the smallest amount of discomfort is experienced and for most people there is very little discomfort. What will my skin be like after treatment? It is normal for the treated area to feel sensitive, show some redness and possibly a little swelling for a few days post treatment. In some cases, a small blister may form. Where deeper lesions have been treated you will leave the clinic with a dressing covering the open wound. After a few days, these initial reactions will disappear but you will then usually experience localised drying and scabbing of the tissue as healing progresses. This is part of the healing process and is a normal reaction after the treatment of most conditions. It will disappear as new healthy skin replaces the old. It is imperative you do not pick this tissue. Providing that the correct aftercare instructions are followed and no infection is allowed to develop, these reactions will go quickly and the risks of any permanent scarring is minimal. In some cases, treatment may leave slight pigmentation variation in the treatment area. This variation may be lighter or darker than the surrounding skin and can affect all skin types. You must notify your practitioner if you are prone to post inflammatory hyperpigmentation, raised scarring or keloid scarring as these issues will either contraindicate or restrict your treatment. Advanced Cosmetic Procedure consultation: The consultation involves carrying out a thorough examination of your skin, check medical history, factors that may have an effect on your skin and confirm treatment suitability. *The consultation fee can be deducted from the cost of your treatment if the treatment done in the same session.